Working from my studio I can gaze up to the top of Exmoor and watch the turning seasons, sometimes we are one of the few places to get the beauty of Winter snow. I take my inspiration from the flora and fauna of the countryside, walking every inch of the local landscape my sketchbook and camera in hand. I studied Fine Art Painting at Falmouth School of Art and Design in Cornwall, there I became inspired by artist's such as David Jones and Cecil Collins I saw mystical and spiritual life in their paintings of the landscape. I also explored the work of Cezanne who's watercolour landscapes are full of light and meaning. After Art School I continued my own fine art practice,as well as working professionally within the arts and raising a family. In 1987 I settled in Devon and now live at the foot of Exmoor a wild and wonderful area that is home to the rare native breed of Exmoor ponies, Red deer and native moorland birds. As a child I drew the birds that visited our garden, I walked the fields of my grandparents farm, excited to get outside every morning to explore. Wildlife and the rural landscape have inspired my work since my days as a student and a sense of wonder at nature and the joy of drawing and painting outside continues to move me. The images that I make are always rooted in something that I have seen, a pattern in the weather, the rolling moorland grass, a group of Exmoor ponies, I hope to depict these sights with a freshness and spirit that I experience being in nature. 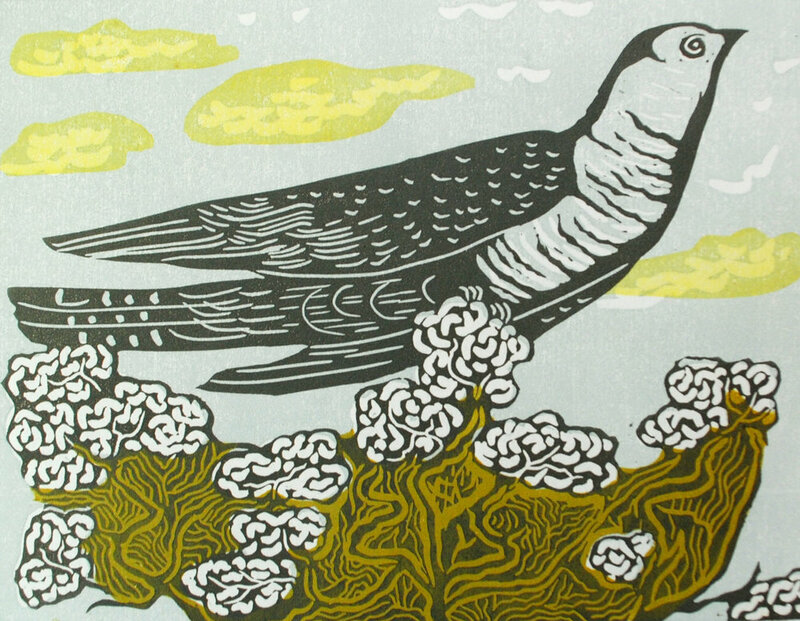 A print is made from one carving (master copy) in an edition or set. Each print is an original and is signed, numbered and titled on the front. When an edition is sold out it cannot be reprinted and so the edition gains value the smaller the number that are produced. I print using Japanese Relief Vinyl/Lino. I carve the surface to create an image which I then roll with ink and next print by hand or press in my studio. Each print is original and can contain subtle differences in texture which is a part of the beauty of printing. I'm inspired by the native wildlife of my local environment of Exmoor in North Devon with it's surrounding hills and valleys. I walk across the rugged moorland and love to sketch and photograph the trees, grasses, wild birds and animals that I find there. Each of the linocut prints that I make begins with these sketchbook and photographic records from nature. "We love it & don't want to give it away now!"